A strong Southerly flow around high pressure in the Atlantic and a deep trough in the East will result in balmy conditions tonight. Spotty showers will give way to a waves of steadier and heavier rain tonight into Saturday as a storm develops over the central Appalachians and moves North. At the same time a front will be sweeping into the area. Thunderstorms are possible as well. Where the plume of heavy rain sets up is yet to be determined. Flooding is a concern, especially in areas that received heavy rain earlier this week. A Flash Flood Watch is in effect for Friday Night and Saturday for the entire tri-state area. The potential is there for one to two inches of rain. 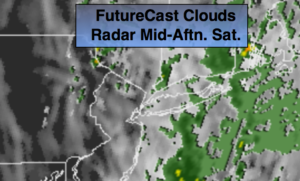 The rain should taper off during the afternoon on Saturday from West to East. At least the last half of Passover will be dry. 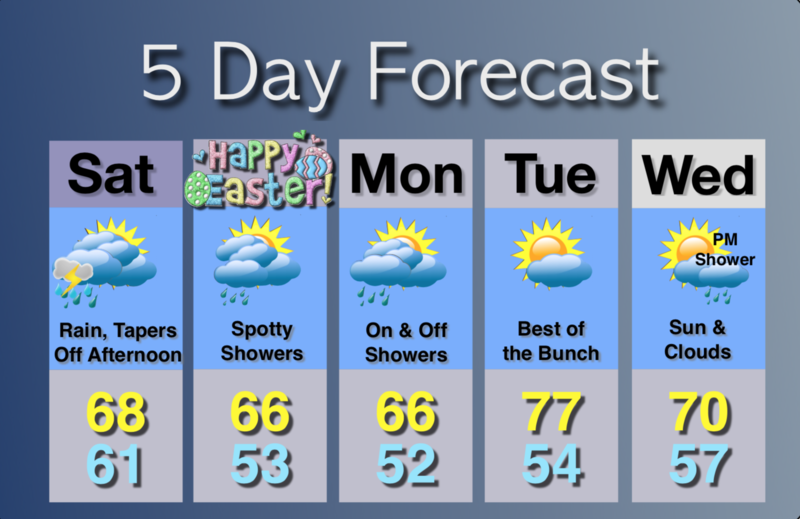 Easter Sunday will feature a mix of clouds and sun. 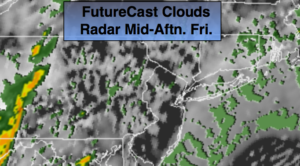 A spot shower can’t be ruled out as an upper level low moves over the area. On Monday, the upper low looks to stall for a time. Some of the models redevelop a low just off the coast. If this pans out Monday will feature showers. Tuesday will be partly sunny and much warmer. On and off rain and scattered thunderstorms. Some of the rain will be torrential. Warm. Lows in the 60s throughout. South wind at 15-25mph. Rain and possible thunderstorms. The rain will taper off during the afternoon. Highs in the upper 60s. Clouds and sun. Spotty showers. Highs in the mid 60s. Mostly cloudy with showers possible. Highs in the mid 60s. Partly sunny. Warm. 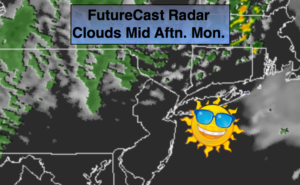 Highs in the mid to upper 70s. Partly sunny. Scattered late day showers. Highs around 70º. A strong Southerly flow around high pressure in the Atlantic and a deep trough in the East will result in balmy conditions and scattered showers today. There will be dry times. More clouds than sun is expected. Passover begins at sundown which is at 7:39PM. A round of steady and heavier rain is likely tonight into Saturday as a storm develops over the central Appalachians and moves North. At the same time a front will be sweeping into the area. Thunderstorms are possible as well. Where the plume of heavy rain sets up is yet to be determined. Also, the speed of the front moving off the coast may slow resulting in the rain continuing into a part of the afternoon. Flooding is a concern, especially in areas that received heavy rain earlier this week. A Flash Flood Watch is in effect for Friday Night and Saturday for the entire tri-state area. Mostly cloudy, warm and breezy. On and off showers. Highs near 70º. South winds at 15-25mph. Rain and possible thunderstorms. The rain will taper off during the afternoon. Highs in the mid 60s. Mostly cloudy with showers possible. 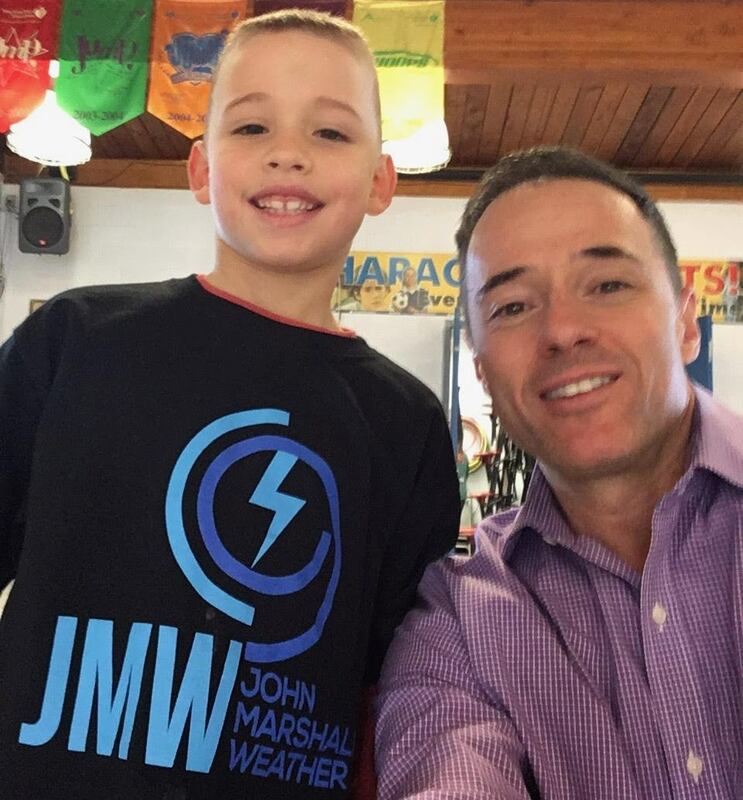 Highs in the mid to upper 60s. Partly sunny. Warm. Highs in the mid 70s. A warm from moved farther North than expected today. This resulted and will continue to result in a fine April afternoon South of the city with partly sunny skies and readings in the 70s. To the North the wind will blow off the ocean resulting in a cool, grey day. The front may slip back to the South tonight resulting in more clouds and areas of fog for regions to the South of the City. On Friday, the warm front will push North of the region again. A deep Southerly flow will develop. Balmy conditions and scattered showers are expected. More clouds than sun is expected. Passover begins at sundown which is at 7:39PM. A round of steady and heavier rain is likely Friday night into Saturday as a storm develops over the central Appalachians and moves North. At the same time a front will be sweeping into the area. Thunderstorms are possible as well. Where the plume of heavy rain sets up is yet to be determined. Also, the speed of the front moving off the coast may slow resulting in the rain continuing into a part of the afternoon. Flooding is a concern, especially in areas that received heavy rain earlier this week. A Flash Flood Watch is in effect for Friday Night and Saturday for the entire tri-state area excluding Monmouth and Ocean counties. On Monday, the upper low looks to stall for a time. Some of the models redevelop a low just off the coast. If this pans out Monday will feature showers and cooler temperatures. This is not etched in stone. Mostly cloudy. Mild. Lows in the 50s throughout. South wind at 10-15mph. A warm from will move toward the region today bringing with it grey skies, patchy drizzle or light rain. The precipitation will be scattered, so not all areas will get wet. The wind will blow off the ocean resulting in a cool day. On Friday, the warm front will push North of the region. A deep Southerly flow will develop. Balmy conditions and scattered showers are expected. Passover begins at sundown which is at 7:39PM. 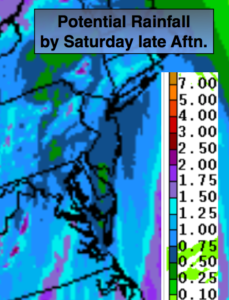 A round of steady and heavier rain is likely Friday night into Saturday. Thunderstorms are possible. Where the plume of heavy rain sets up is yet to be determined. Also, the speed of the front moving off the coast may slow resulting in the rain continuing into a part of the afternoon. Flooding is a concern, especially in areas that received heavy rain earlier this week. Mostly cloudy. Areas of drizzle and light rain. Highs around 60º. East to Southeast winds at 10-20mph. Mostly cloudy and warm. On and off showers. Highs near 70º. Partly sunny and warm. Highs in the mid 70s. 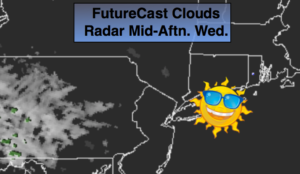 Any clouds will give way to mostly sunny skies today as high pressure slips off the New England coast today. A warm from will move toward the region on Thursday bringing with it the possibility of some showers or patchy drizzle. On Friday cool front will be approaching from the West. Ahead of the front a deep Southerly flow will develop. Balmy conditions and scattered showers are expected. Passover begins at Sundown which is at 7:39PM. A round of steady and heavier rain is possible Friday night and Saturday morning. Where the plume of heavy rain sets up is yet to be determined. The sun should return for a time Saturday afternoon. Becoming mostly sunny. Highs around 60º. Northeast to Southeast winds at 5-10mph. Becoming mostly cloudy. Lows in the 40s throughout. Southeast winds at 5-10mph. Mostly cloudy. Areas of drizzle. Highs in the upper 50s. Morning rain, some afternoon sun. Highs in the mid 60s. Clouds and sun. Spotty showers. Highs in the lower 60s. A quick moving disturbance will head our way from the Northwest tonight with increasing clouds and scattered showers later this evening and tonight. The rain will not be heavy and not all areas will get wet. Another high will slip off the New England for Wednesday bring with it plenty of sunshine and seasonal temperatures. A warm from will move toward the region on Thursday bringing with it the possibility of some showers or patchy drizzle. On Friday cool front will be approaching from the West. Ahead of the front a deep Southerly flow will develop. Balmy conditions and scattered showers are expected. Passover begins at Sundown which is at 7:39PM. 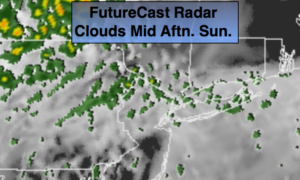 Increasing clouds with areas of light rain developing later this evening and tonight. Lows in the mid 40s in the City, the upper 30s inland. Northwest to Northeast winds diminishing to 5mph. Today will start off with sun as high pressure dominates over the Mid-Atlantic. A quick moving disturbance will head our way from the Northwest later in the day with increasing clouds. Scattered showers are expected later this evening and tonight. Another high will slip off the New England for Wednesday bring with it plenty of sunshine and seasonal temperatures. A warm from will move toward the region on Thursday bringing with it the possibility of some showers or patchy drizzle. On Friday cool front will be approaching from the West. Balmy conditions and scattered showers are expected. The Holiday Weekend looks unsettled with times of showers, but there will also be some sun. Sun to afternoon clouds. Highs in the lower 60s. West to Northwest winds at 15-25mph. Cloudy with areas of light rain. Lows in the mid 40s in the City, the 30s inland. Northwest to North winds diminishing to 5mph. Becoming mostly sunny. Highs around 60º. Mostly cloudy. Spotty showers possible. Highs around 60º. Mostly cloudy and warm. Showers possible by afternoon. Highs near 70º. The storm that gave the region scattered severe thunderstorms early this morning is moving into Northern New England. Winds will increase today behind the storm and become strong. Gust up to 45mph out of the West to Northwest are likely. A Wind Advisory is in effect for the entire tri-state area. Skies will be mostly cloudy and a spotty shower can’t be ruled out. The winds will abate some later tonight but it’ll still be gusty. Temperatures will be much colder than recents nights. Tuesday will be the pick day of the week with mostly sunny skies as high pressure dominates over the Mid-Atlantic. Another high will slip off the New England coast midweek and a stationary front will be in the vicinity. This will result in more clouds on Wednesday with the possibility of some showers or patchy drizzle Thursday. Readings near the seasonal average of 60º. By Friday another front will be approaching with balmy conditions and possible showers later in the day. Clouds, some sun. Becoming windy.. Highs in the lower 60s early then temperatures will fall through the 50s. West to Northwest winds at 15-30mph with gusts to 45mph. Clearing, windy and chilly. Lows in the 30s to lower 40s in the City. West to Northwest winds at 15-30 with gusts to 45mph early, diminishing some late. Sun and clouds. Highs around 60º. A storm over the Ohio valley and ride North into Northern New England the next 24 hours. There will be areas of fog, spotty showers and drizzle through early tonight. A period of heavy rain and possible severe thunderstorms are likely late tonight and very early Monday morning as the storm moves well to our Northwest and drags a cold front through. Some of the storms may contain winds in excess of 58mph and torrential rain. 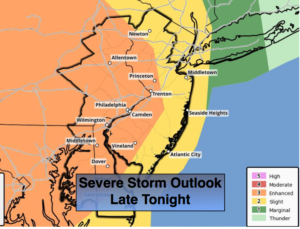 The 1st map above depicts an enhanced risk of severe storms over Western section of the tri-state area. Farther to the East a slight risk of severe storms is possible, which includes the NYC vicinity. After the rain and storms end early Monday morning it will become partly sunny and windy. Winds could gust up to 45mph out of the Northwest. Cloudy with areas of fog, drizzle and showers. A period of rain and thunderstorms is likely late tonight. Lows in the 50s to around 60º throughout. South to Southwest winds increasing to 15-25mph with higher gusts. Rain and thunderstorms ending during the early morning, becoming partly sunny and windy. Highs in the lower 60s. Northwest winds at 15-30mph with gusts to 45mph.